When Renny Barris decided to open a pizza parlor in Novi, Michigan, he needed a lot of help. He'd researched the Michigan market and knew full well that pizza sells, but when it came to setting up the kitchen and stocking the entire restaurant he didn't have a clue. That's because Barris had never owned a restaurant before. "This was a whole new thing for me. I was coming from being a manager at Blockbuster Video." His franchisor suggested he check out Restaurant Equippers in Columbus, Ohio, touted as "The Largest Restaurant Equipment Store in the Midwest". But before he could drive to Ohio, or even place a phone call, something rather ironic happened. Restaurant Equippers opened a second huge warehouse store literally right down the street from where he lives. "I would have called and placed my orders by phone, but going down to look and talking to people who know the business is so much more convenient." That is exactly why Restaurant Equippers opened its 36,OOO-square-foot store in Southfield, Michigan. The new warehouse store marks the company's first ever expansion in its 42-year history. With a growing list of hundreds of thousands of mail order customers nationwide, Restaurant Equippers felt the time was right to expand. And Michigan was the likely place to do it. "Physically expanding into the Metro Detroit area was a no-brainer," says John Eberhart, the General Manager of the new Southfield store. "We have thousands of mail order and internet customers in greater Michigan who even in today's age of online ordering, still like to see and touch what they're buying." Similar to the Columbus warehouse store, there is plenty for customers to put their hands on. Restaurant Equippers carries, in-house, absolutely everything a new restaurant needs to operate, which is fairly unusual in the industry. A new restaurant can buy it all and leave with it that very day or have it shipped immediately at discounted freight prices. The majority of their customers are "mom and pop" operators like Barris, whose grand opening for Guido's Premium Pizza is slated for February. "When 1 came in, 1 told them I'd never done a restaurant before. We just went down the list and they had everything we needed, from the walk-in cooler to refrigeration units to smallwares and utensils. They explained which items I would need, and which would be best. They really helped out." Restaurant Equippers has been drawing customers like Barris since it opened in Columbus in 1966. The company started out as a "mom and pop" operation itself and is still family owned and operated. They send out 4 million catalogs a year, manage a 170,OOO-square-foot distribution center in Columbus, and have recently revamped their website to include online ordering. Their customers consist of food service operators from allover the country; some own just one restaurant, others own several. Even though they ship to all 48 contiguous states, it's not unusual to find their Columbus store parking lot filled with customers' trucks and trailers from all over the U.S. "Sometimes our customers need a product right away. They know we have a huge inventory - they can come in, get it and drive it home," Eberhart explains. Like the Columbus location, the Michigan store is open to the public. The popularity of the Food Network and other TV cooking shows has increased homeowners' interest in outfitting their own kitchens, Eberhart believes. That's led to an ever growing number of walk-in customers too. Restaurant Equippers carries many product lines with which homeowners would be familiar. And because they buy in bulk, they can keep the prices low, sometimes half as much as you might find at retail home stores. The new warehouse store also offers even lower priced scratch and dent bargains, factory overstocks, and clearance items. 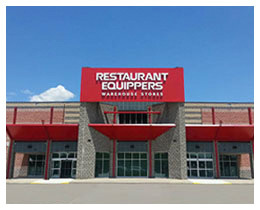 With over 40 years in business, duplicating the Restaurant Equippers Warehouse Store in Columbus is a tough act to follow. But Eberhart says the Michigan numbers are already a little bit ahead of expectations and the new store's design will help make it every bit as successful as its Ohio predecessor. "The draw of our new store isn't just the extensive product line and low prices, but the store itself," Eberhart explains. "It is much better set up to be a retail operation than our store in Columbus. It's big and open. New customers who come in have said it's like being a kid in a candy store." Eberhart, a former Columbus Sales Manager, has enjoyed finally meeting many of his Michigan customers face to face. "For years I worked with a Michigan man who owned 8 steakhouses. We worked together a lot but it was always by phone. Then the other day I heard a familiar voice. I turned around and there was the owner of Lucky's steakhouse, shopping in our Southfield store. It was great to finally put a face to the voice." Opening other warehouse stores around the country is something Restaurant Equippers is considering as well. Eberhart is convinced the warehouse stores will appeal to their customers nationwide. "When you buy something that directly affects your business you want to touch it and feel it. Now you can do that."